The massive, waterfront street party is one of the largest New Year’s celebrations in the Southeast drawing 100,000 revelers to two stages of live entertainment and a wave of food, DJ, cultures and good times sailing into 2019. The anchor measures 20 feet high and 17 feet wide. It weighs more than 700 pounds and features close to 12,000 color-changing LED lights with a wide range of features and effects which create a spectacular visual display for event-goers. The anchor descends from 100 feet in the air above the event’s main stage as the final seconds of 2018 tick down and onlookers usher in the New Year. 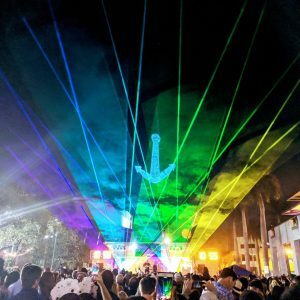 A five-minute pyrotechnic display brilliantly illuminates the sky above Downtown Fort Lauderdale with bursts of custom-mixed colors lighting up the night as confetti descends on partygoers. And of course the band plays on. Blessed by year-round sunshine, street festivals and beachfront eats, this South Florida destination will be sure to create the best memories. There is something for everyone when it comes to celebrating New Year’s Eve in Fort Lauderdale.